Hey Earles, get any rain up there?? Maybe a clap or two of thunder?? The white spots and streaks are heavy rain. Pounding, driving rain I can hear inside the house hitting the metal roof and windows. You can see what else is hitting the grass, trees and wet driveway. Summer in the country I guess. I'm soooo glad that we give that to them every summer instead of the other way around. 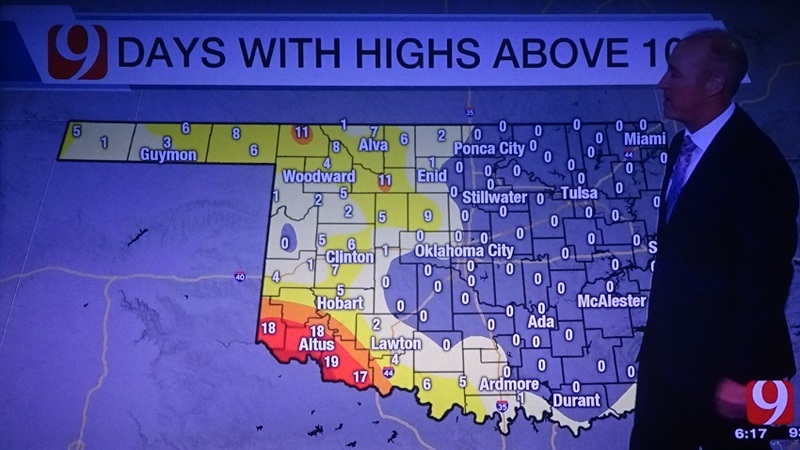 Map shows total days of highs above 100 in Oklahoma, which is confined to most of the western half of Oklahoma. Far southwest Oklahoma easily has the hottest summers. Some of the worst drought in the state is there. Oklahoma City hasn't gotten to over a 100 yet, and 10 day forecast has no 100s in it. The same with Tulsa. This summer's weather hasn't been noteworthy of much of anything unusual. The forecast from the Scripps station here does show 100 and 101 for Sunday and Monday. NWS shows 96/97 for those days. The humidity is back however and we have a heat advisory again tomorrow. Who knows. As long as it's not like 2011 all over. That summer was brutal. Seems to be something afoot that will yield a significant cooldown after the 17th or 18th. Two week forecast (which I know is Voodoo) has been consistent over the last couple of days showing mid 60s/low 80s from the 18th through the 26th. If it happens, I'll welcome it. 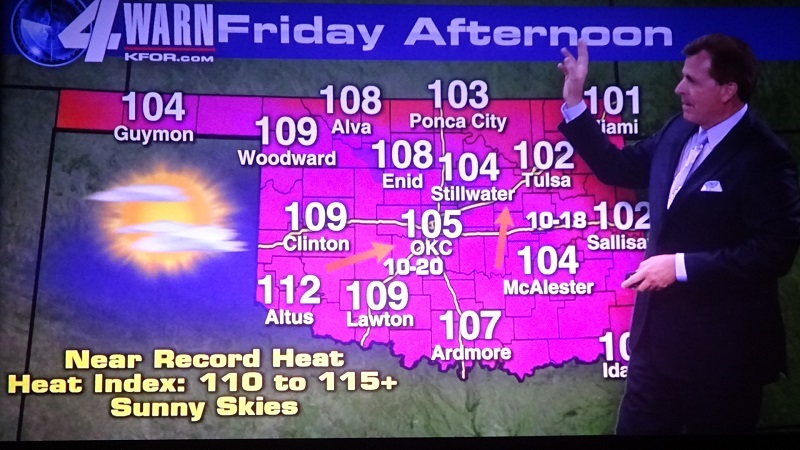 Massive 100 plus HEATWAVE in all of Oklahoma coming Friday. We'll see if the TV weatherman's hype pans out. Davis just took its first 75 mph wind this morning in a surprise 20% chance severe t-storm. Also, the Davis rain gauge measured .51" in 30 min, while my CoCoRaHS measured .48" in the same period. Dangerously high heat index in Stillwater with 120 during Thursday afternoon. Dew point 76. Even hotter temps not seen in five years expected on Friday. This was my CumuluxMX page today on my Davis. There is a huge thread about the Davis SHT31 humidity reliability primarily having a high bias 5-8% humidity especially when hot and humid. Davis is actually taking a serious look into what may be causing this issue. FYI I've got a couple acurite sht31's that don't display the same high bias so it may very well be the way chip is molded into board or handling, shipping sensors and storing in bubble wrap. The handling procedure stresses to avoid any plastics made of polyethylene which is almost all plus sensor shouldn't be open air but stored in appropriate bags. None of this was being done. These were the peak heat index readings at Tulsa and Stillwater yesterday at airports. Compare to the Davis stations if you own one. I live in a bit of a microclimate; my humidity is always higher than the airport. Live in a depression that's quite a bit lower in elevation next to a rather large creek. The mixing creates more moisture for me. I used to think I had bad weather units but this exists across three different weather station brands and I've verified with a sling psych. It's no fun if I have to mow in this. I try and mow early in the morning. I don't live in a depression, so I call into question the accuracy of the humidity reading on my Davis. The current temp here is temp 106 with 118 heat index. NWS said heat index would get up to 113. Looking at Stillwater 109°F 113° heat index at airport. Ouch! keep it down in Oklahoma..We had 112° ambient airport 108° at my station last year & no fun, doesn't take much humidity to make it feel real bad. Very good. I really need to guywire my telepole. It turned into a propeller the pole bent so far over at peak wind so only recorded 60mph. I've had 72 before and pole didn't bend that far so actual was more in 80-85 mph likely. My turn early next week. Progged for 111F Tue., no big deal here, but dews will probably hang on enough to put us around a 115F index. Excessive heat warning is already out. looking at any more 90 degree days through the end of July." 119 Heat Index here yesterday. Don't think I could have been any more wetter after cutting the grass unless I took a shower. Slight risk today also as the weather radio just went off with a Severe TS Watch. Low probability of tornadoes just enhanced straight line and possible downbursts. I probably should gas up the genny just in case. Was that with the Davis station or airport. Many have noticed the Davis has a really high heat index bias with humidity running for some 10% high especially when it gets muggy. Pulling up yesterday the Ocala International Airport - Jim Taylor Field, FL. 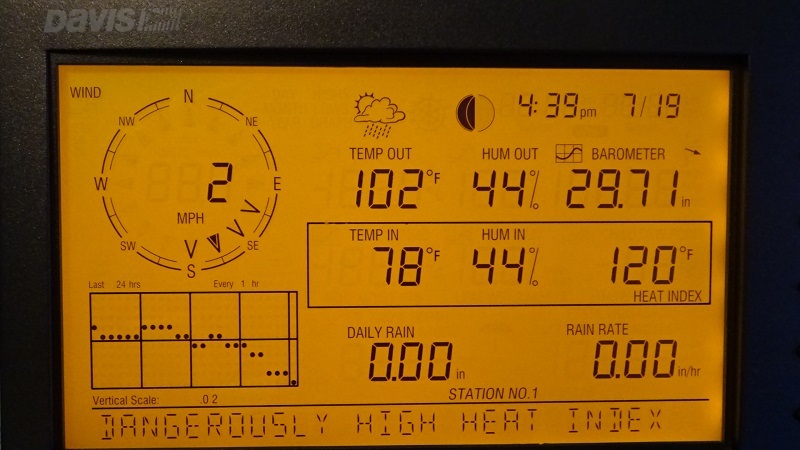 reported high temp of 91.4°F at dewpoint 77° making for heat index of 105°. It was the Davis. Does the new sensor rectify that?